Home-administered healthcare is growing in popularity both among senior citizens and as an industry. 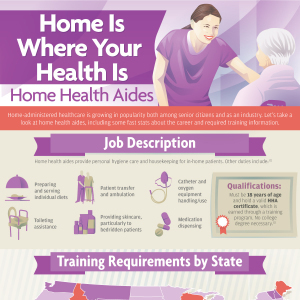 Let’s take a look at home health aides, including some fast stats about the career and required training information. The expected job growth for home health aides is high because there is and will continue to be a definite shortage as the Baby Boomer population grows older.